NOVEMBER 30 – DECEMBER 1. VISIT TO THE TOMB OF PETER THE APOSTLE IN ROME. Our bishop was in Europe from Sunday, November 28 to Thursday, December 2. The first phase of the trip was in Rome, where in addition to visiting friends of many years, he took the opportunity to visit the tomb of the Apostle Peter. 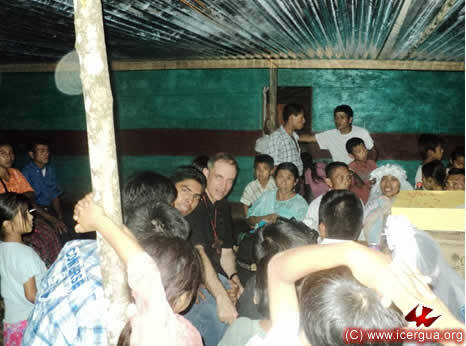 It was in this place in November 2002 that our bishop felt the call to launch the new mission that eventually turned into ICERGUA. He has told us that his visit was charged with spiritual depth. 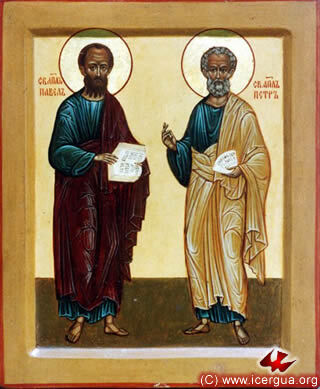 In addition to giving thanks for the call and feeling reaffirmed in the mission that has begun, he experienced a deep feeling of communion with the Apostle Peter, feeling impelled to continue moving ahead in the task of having our church, through the work of the Holy Spirit, reflect the full catholicity of the apostolic church, so that, based completely on the witness of the Scriptures, it may keep faith wholly with the Apostolic Tradition and the teachings of the Church Fathers. 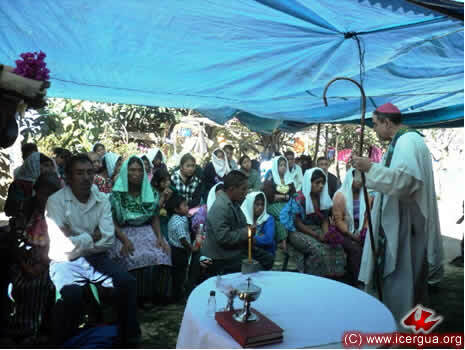 Full catholicity also means for ICERGUA that in its faith, liturgy and organization it replicate in every way the form of the indivisible church during the first millennium in the western tradition, to which we belong. Our bishop flew from Rome to Hamburg in order to visit Father Ottmar Mickmann in the St. Patrick Oasis, Bremerhaven, where he lives. Joined to ICERGUA, Father Ottmar lives a life of prayer, following the rules of Benedictine spirituality. In addition, Father Ottmar cared for his mother until she was called to be with the Lord on November 24. 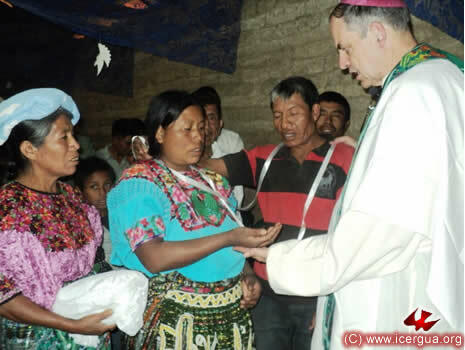 Our bishop brought ICERGUA’s condolences to Father Ottmar and presided at a Eucharistic celebration to pray for her full participation in the Communion of the Saints. 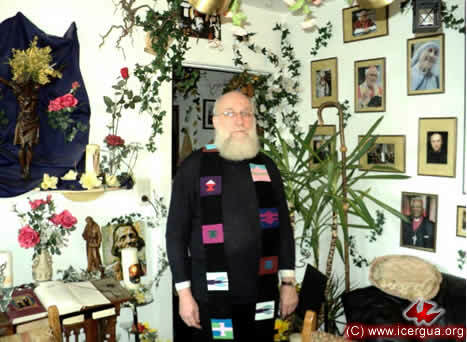 Above: Father Ottmar in the oasis. Right: Monsignor Eduardo and Father Ottmar in prayer. One of the basic commitments that is implied in our mission is to attain ecclesial unity. Aware that true ecumenical unity is to be attained only if the Apostolic Tradition and the faith, worship and organization of the undivided church is rediscovered, and acting as the representative of the Presbytery and all the communities of ICERGUA, our bishop began conversations to work toward that full unity. These dialogues are being held with those who are keeping to the unaltered catholic faith and have stayed within the one, holy catholic and apostolic church. The New York meetings on December 2 were very positive. We are confident that the Lord is leading us on paths that will lead to full unity. So that that may take place, we ask the prayers of all the members of ICERGUA and of all the friends who read this website. 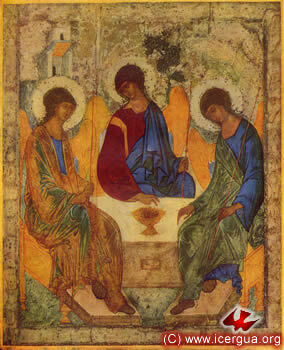 Above: Icon of the Holy Trinity. The unity of the Church replicates the unity of the Trinity, as Jesus prayed, Father, that they all may be one, as you and I are one. 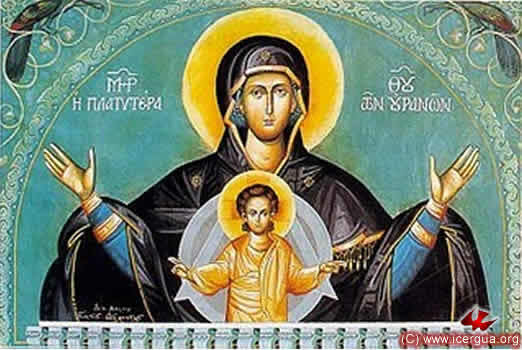 Right: Icon of the Mother of God. Mary’s attitude, expressed in the words, “Be it unto me according to your word,” models the attitude that we are called to have in order to attain perfect unity. 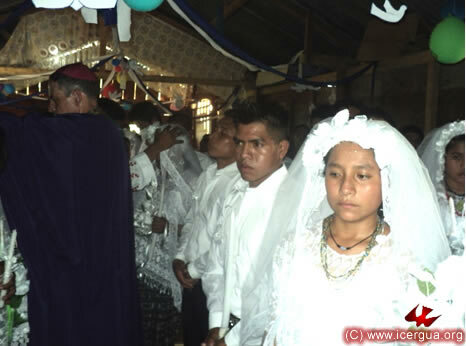 On Saturday afternoon, December 4, Diego and Francisca, a couple who belong to the Pacto Divino Community, united their lives through the sacrament of marriage. Diego has been an energetic member of the community for many years. Francisca joined more recently, and also participates actively. All the faithful who comprise the community, coordinated by brother Danilo, did everything in their power to make the ceremony as beautiful and spiritually joyous as possible. Above: The bishop, as a special witness, receiving the matrimonial consent that Diego and Francisca are exchanging. 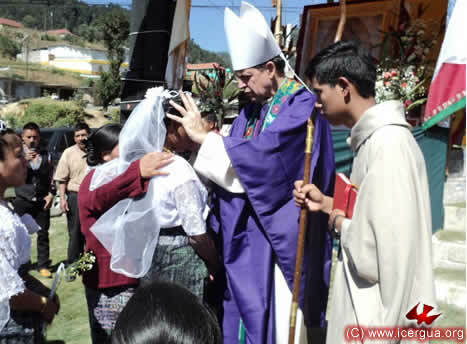 Right: The bishop and the whole community invoke the outpouring of the Holy Spirit so that the union of the new couple may be elevated to sacramental power. 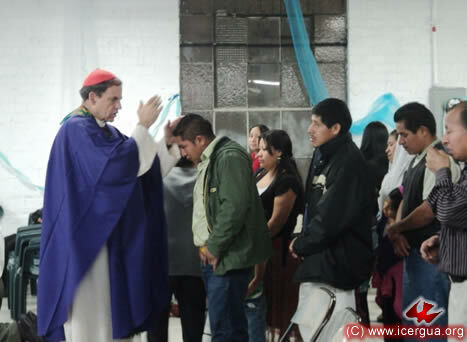 In the evening the bishop presided at a Eucharistic celebration with the El Pescado Community, where the Parish of San Miguel Arcángel is centered. The celebration focused particularly on Advent as the preparation for the celebration of the Nativity. Above: The bishop exhorting the faithful to whom the sacrament of Reconciliation is to be administered, telling them to repent humbly and confess their sins. Right: After the confession, those who participate in Reconciliation come forward to receive Absolution from their sins. DECEMBER 5. 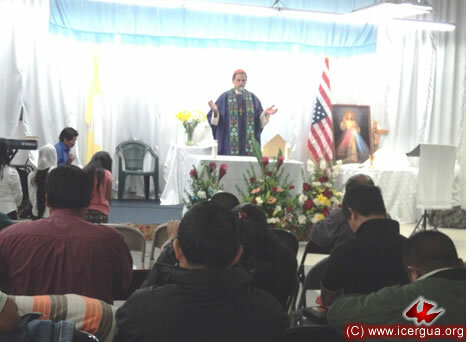 ESTYMLA INSTRUCTION AND EUCHARIST IN THE SAN MIGUEL PARISH, LOS ANGELES, CA. On Sunday morning, the bishop addressed twenty students at the fourth session of ESTYMLA. Left: Exchange during the break between the first and second parts of the instruction. The bishop is talking with brothers Victor and Lorenzo, members of the community’s coordination team. Right: Some of the students at the educational program on Sunday, December 5. This instruction included an exchange of ideas about ways to improve participation within the parish and foster attentiveness to one another’s needs. Various initiatives were suggested, and the coordination team that plans the community’s programs was charged to carry them out. After the instruction the bishop celebrated the Holy Liturgy for the Second Sunday of Advent with the participants. Above: The homily, which centered on the characteristics that our steadfast readiness should have so that Christ may be continuously born in each of us through the work of the Holy Spirit. Right: In a large circle, all the participants about to pray the Our Father. 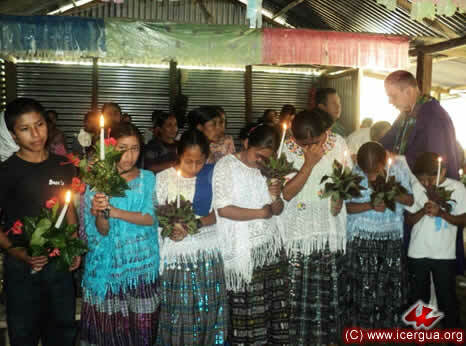 On Friday, December 10, our bishop began his pastoral work in the Tzununá Community, Santa Cruz La Laguna, Sololá. 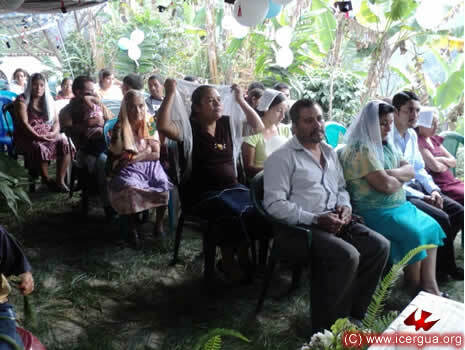 In this occasion the celebration of baptism of one the village’s civil leaders had been prepared. 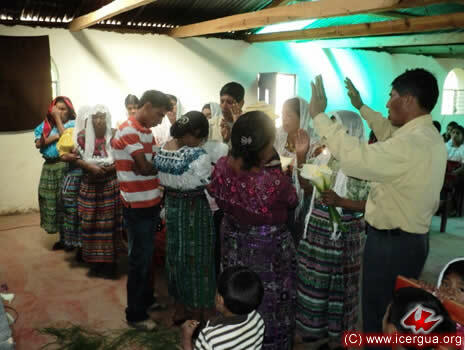 Representative public servants were also present, and the ceremony was carried out in an atmosphere of prayer and gladness for receiving a new member into the Body of Christ and the Tzununá Community. Above: Monsignor Eduardo administering the sacrament of Reconciliation to some of those in attendance. Right: The parents and sponsors pray over the child who, a few moments before, had been baptized and prepared for the chrism. 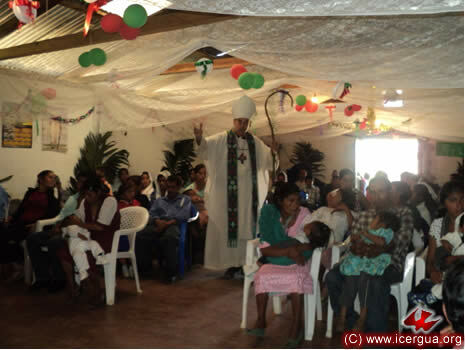 Around midday on December 10, our bishop celebrated Eucharist with the Jaibalito Community. Besides the Mass, the faithful had prepared the blessing of the church door and the plaster work on the façade, and had also recently acquired new chairs. All the faithful that could attend did so with deep devotion. The community’s steadfast commitment to consolidation as a Renewed Catholic community in every sense as well as to evangelism was visible in many ways. Above: Outside the church, the bishop and the People of God pray that the Lord may shed his blessing on the new entrance. DECEMBER 10. 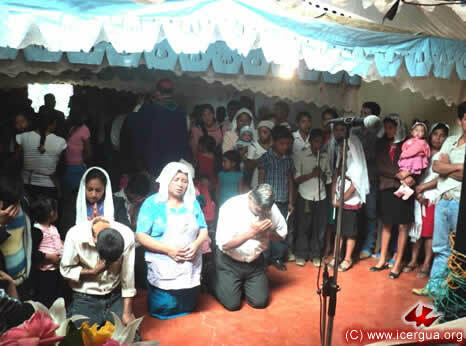 BLESSING THE TABERNACLE AND BAPTISMS IN THE PENTECOSTÉS COMMUNITY, SANTIAGO. 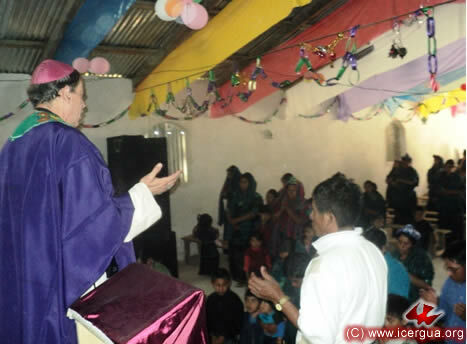 In the afternoon our bishop presided at the Eucharist with the Pentecostés Community in Santiago Atitlán. On the occasion, three children, whose parents recently joined the church, received Christian Initiation. 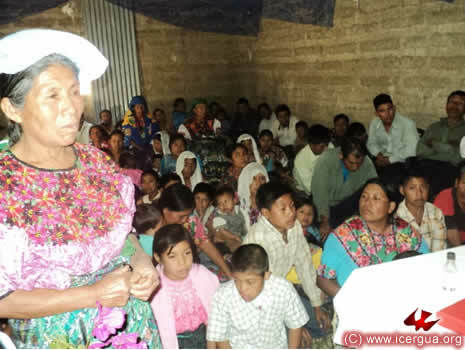 The children—Manuel, Josefa and Francisca—had been so well prepared that they participated actively in the celebration and were fully aware of what they were saying when they expressed their desire to be incorporated into the Body of Christ, the Church. 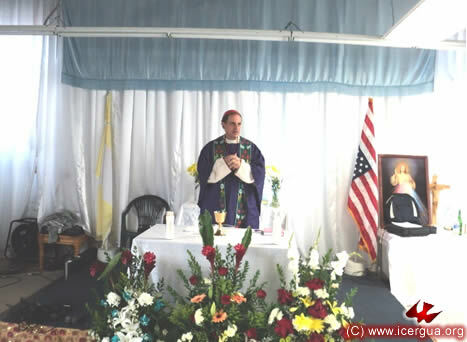 The visit was the opportunity for the faithful to ask the bishop to bless the new tabernacle that had been made so that the reserved Holy Sacrament could be moved from where it used to be to the center of the altar, where the faithful could approach it and adore it more devotedly. DECEMBER 10. 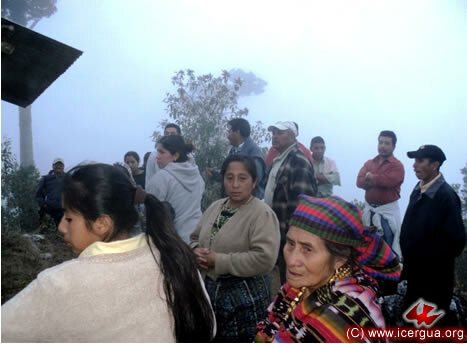 BAPTISMS IN THE COMMUNITY OF THE EFUSIÓN DEL ESPÍRITU SANTO, SANTIAGO ATITLÁN. Near the end of the afternoon, Monsignor Eduardo celebrated Eucharist with the Efusión del Espíritu Santo Community of Santiago Atitlán. The faithful participated devotedly. 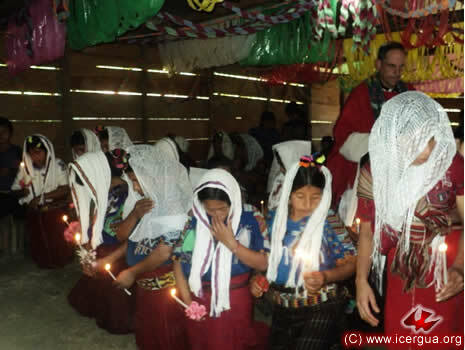 Four children received Christian Initiation. Above: Those who had made the confession of their sins come forward to receive Absolution. 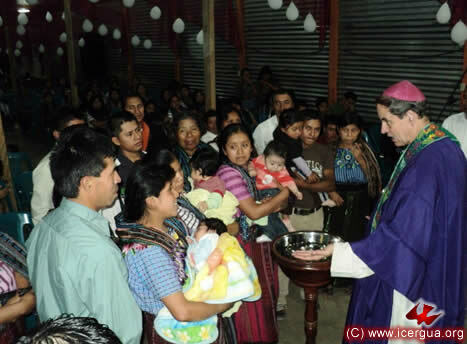 Right: The bishop asking the parents and sponsors of the children to be baptized whether they are ready to take on the serious promises involved in the Christian life before proceeding to the sacrament. 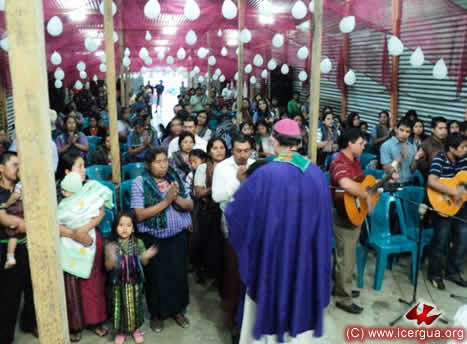 On Saturday morning, December 11, Monsignor Eduardo presided at the anniversary celebration of the Xolbé Community in the municipality of Sololá. The faithful were eager to participate with heart, mind and strength in the celebration. They were at prayer and praise the whole day. Above: Those who have confessed their sins coming forward to receive absolution. 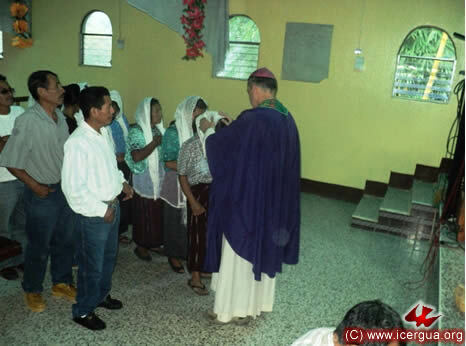 Right: The many faithful coming forward to receive Communion. 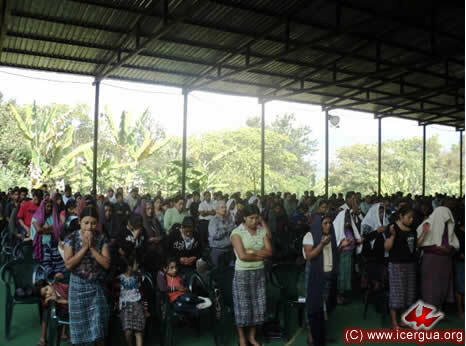 Sunday, December 12, the third Sunday of Advent and the Feast of Nuestra Señora de Guadalupe, had a special significance in the Renewed Catholic Communities of the Municipalities of Soloma and San Juan Ixcoy. After several years of preparation, the Renewed Catholic Parish came into being on that day under the sponsorship of Our Lady of Guadalupe. The faithful had prepared the occasion splendidly and had invited the civil and military authorities and also representatives of ancestral religion to participate. Above: On entering, the bishop greets the crowd that was to participate in the celebration. Right: Father Luís Felipe Corimanya Monge, Presbyter of the new parish, welcoming Monsignor Eduardo before the Eucharist. 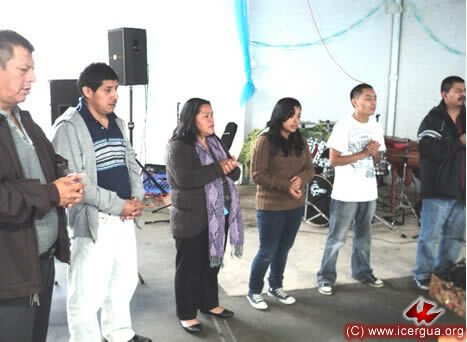 During the celebration, a large number of young people received the Confirmation of the anointing of the Holy Spirit. 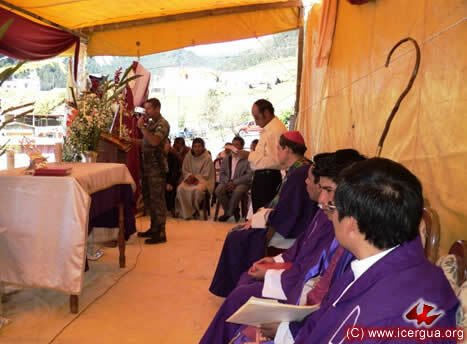 Among the protocols, the leaders of the community welcomed the bishop and the civil and military authorities. Each of them addressed the assembly. In the photograph at left: the military representative giving his greeting. At the viewer’s right of the soldier is brother Paulino, charged by the community to be the master of ceremonies. Then one sees the bishop, Father Hugo Patzán (Presbyter of the Santa Cruz Barillas Parish), Father Luís Felipe and Father Fredi Mux (Presbyter of the Santa Eulalia Parish). During the homily the bishop gave considerable time to exhorting those who were to receive the sacrament of Confirmation to take their Christian promises seriously. The ceremony of anointing with the holy chrism, marked with an attitude of profound prayer. In the photograph at left: the bishop anointing one of the young women who was confirmed. To the right of the bishop is seminarian Arturo Pedro, who was accompanying the bishop and served as acolyte. 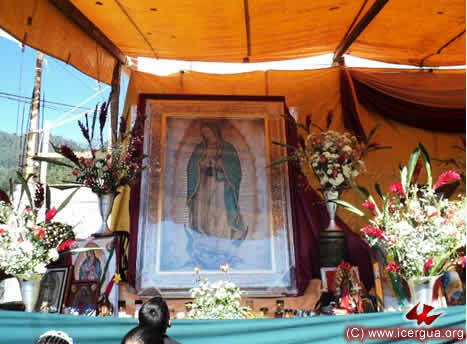 When the Eucharistic celebration was complete, the blessing of the beautiful painting of Our Lady of Guadalupe took place. It will preside over the parish church, whose construction will begin very soon. The painting was brought directly from the Church of Guadalupe in Mexico and is certified to be an authentic and faithful copy of the original in that church. 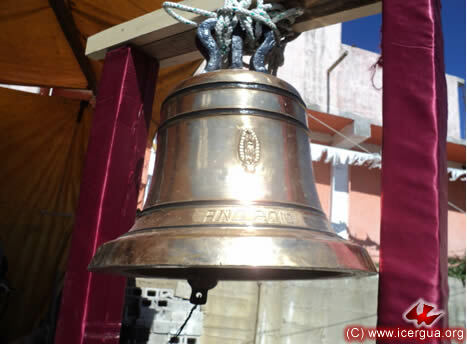 In addition, the blessing of a beautiful bell, weighing seventy-five kilograms, took place. It was brought from Mexico and will be installed in the bell tower of the future parish church. The celebration ended with lunch, which included special guests and the various councils of the Parish. 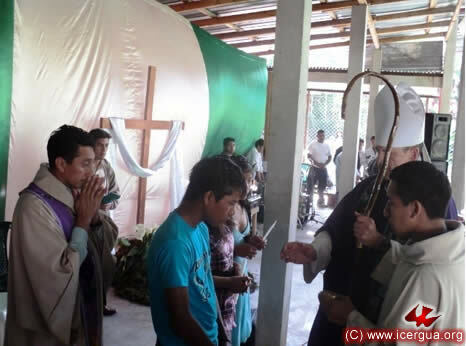 For the afternoon, members of the Parish Council of Soloma had invited the bishop to make a pilgrimage to the Mount of the Virgin, or Mount of Guadalupe, which is located in the western part of the Village of Ixlacuitz, which is the see of the new Renewed Catholic parish. According to the ancestral traditions of the town of Soloma, this hill is the special place for offering thanksgivings and supplications on behalf of the entire town. For this reason the bishop celebrated Eucharist at the summit. 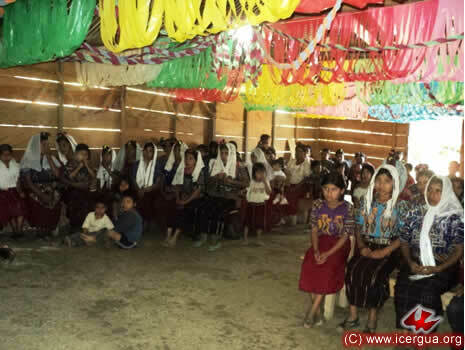 Particular prayer was offered to ask for peace and reconciliation for the town of Soloma which recently has been divided by the ambitions of conflicting power groups. Above: The pilgrimage to the Mount of Virgin, or of Guadalupe. Right: Prayer during the Eucharistic celebration at the summit. At the end of the celebration, a large group of faithful arrived to join the members of the Council in the Thanksgiving. 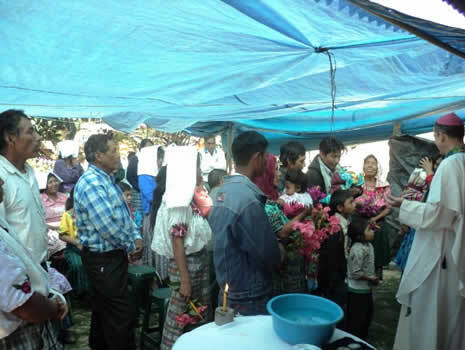 On Monday, December 13, the bishop visited the Chuitzanchaj Community specifically to give thanks for all the blessings that the Lord has granted to the community over the course of the years and to ask for blessing for the coming year. Indeed, the community received abundant blessings during 2010, and grew steadily. Many families have joined. Proclaiming the Gospel to other communities is projected with great enthusiasm. Above: The bishop enjoining the community to pray, following the homily. 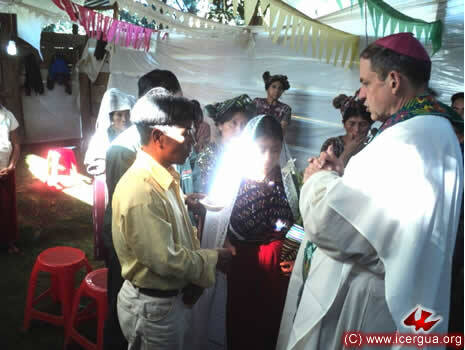 On Friday, December 17, our bishop visited the El Sisilar Community in the municipality of la Libertad, Huehuetenango. 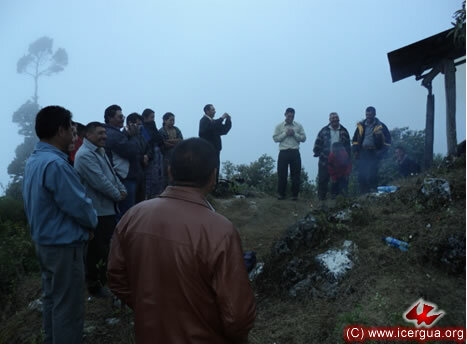 The celebration of Christian Initiation for twenty-two people took place during the visit. Some of them were adults. In addition twelve young people had been prepared for Solemn Communion. Getting to the community required a long trip, but all the efforts were amply rewarded by the sight of the enthusiastic attitude of the faithful. They renewed their promise to continue working to live their faith fully and to evangelize in accordance with Christ’s command. Above: The faithful at prayer after they have received the Absolution for their sins. Right: The baptism of one of the twenty-two who were initiated into the Christian life. 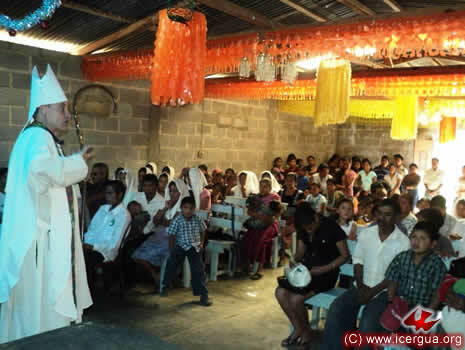 On the afternoon of December 17, our bishop made a visit to the La Vega Community in the municipality of La Democracia. It included a meeting with some of the servants at year’s end to make their annual recommitment to the church’s work. The ceremony was very beautiful, and the faithful felt strengthened to carry their mission work forward. Above: After the confession of sins and the invocation of the Holy Spirit, the faithful came forward and received the sacrament of Absolution. 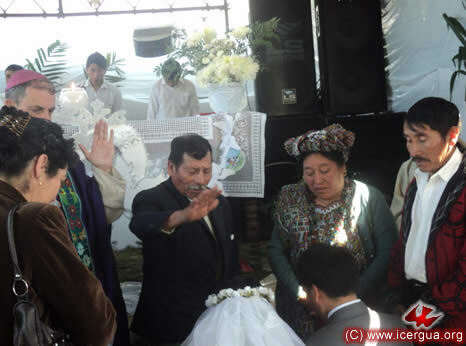 On the morning of December 18, our bishop visited Nebaj, El Quiché for the wedding of Francisco and Aura. Brother Francisco is the owner and director of Channel 15, which broadcasts by cable in Nebaj. Sister Aura has received the gift of prophecy and works actively in the community. The ceremony was splendid, and some representatives of other Renewed Catholic Communities participated in it. Above: Some of the participants in the celebration. 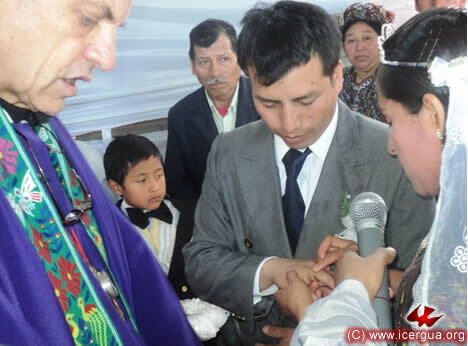 Right: Francisco and Aura as they are exchanging rings, which signify the love and faithfulness that, in the name of the Father, of the Son and of the Holy Spirit they will profess, by the grace of God, forever. 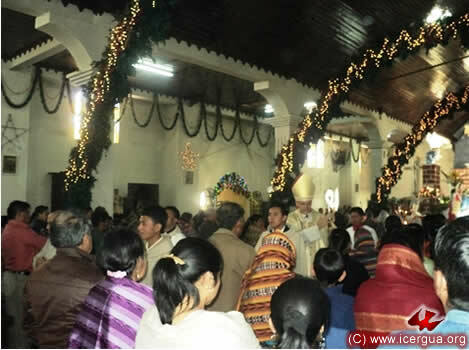 Left: After the second invocation of the Holy Spirit, the parents and sponsors of the newlyweds, pray over them, asking the grace of the Lord. They blessed them, asking the Lord to accompany them and give them fidelity throughout their lives. 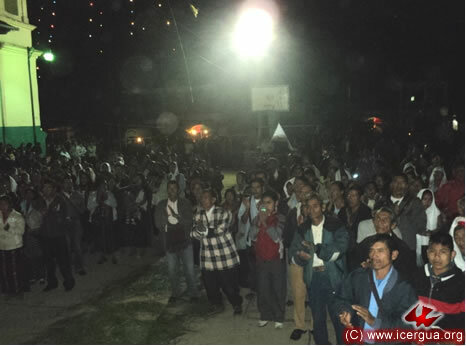 During the evening of December 18, the community of the faithful in the municipality of San Pedro Necta celebrated their twenty-third anniversary with a beautiful concert in the central park. The program began with a Eucharistic celebration, presided by Monsignor Eduardo. More than five hundred of the faithful were there for the prayer vigil. In addition another five hundred inhabitants of the city joined the celebration. 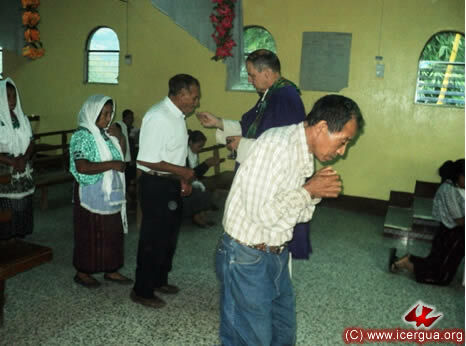 The program was carefully prepared, and for the faithful it had special importance as the moment when they accepted the commitment to work with greater zeal so that soon they may be constituted as a parish and that they can organize Renewed Catholic communities in places where none now exist. Above: The crowd during the celebration. Right: Our bishop during the greeting of Peace, exchanging Peace with some of the participants. Left: During the Communion. 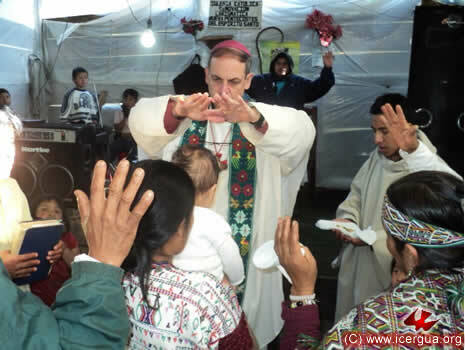 Concelebrating with the bishop was Father Marco Tulio Calderón Mira, who can be seen distributing the Communion. 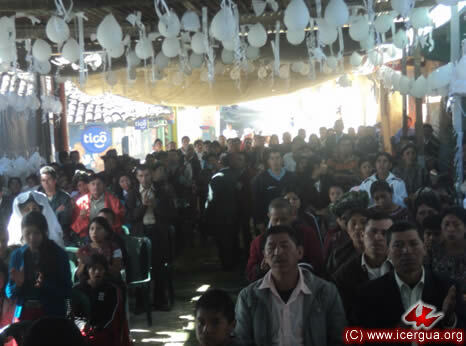 On Sunday, December 19, more than a thousand delegates participated in a most beautiful assembly of the two municipalities of Jacaltenango and Concepción Huista, which form the West Huehuetenango Deanery and whose pastor is Father Santos Acosta Sol. The celebration was very beautiful. It had been carefully prepared and according to the witness of the faithful who were there it served to reaffirm their sense of belonging to the church. 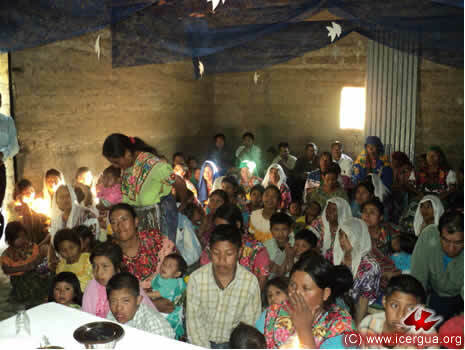 It also helped them to renew the commitment to evangelize on behalf of the whole People of God. Above: The bishop’s opening prayer at the beginning of the Assembly. 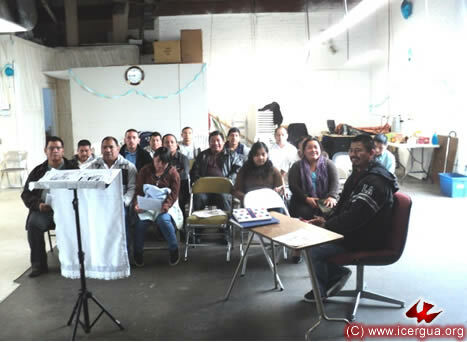 The center of the Assembly was the seventy-five minute instruction that Monsignor Eduardo gave on the theme, “The Characteristics of the ICERGUA Mission.” The question held the interest of all the participants. At many moments the power of the Holy Spirit that was guiding the assembly could be felt. During the Eucharistic celebration three young people were confirmed in the anointing of the Holy Spirit. His presence and the administration of the sacrament signified to the entire assembly that they too were promising to live out the anointing of the Holy Spirit and to witness to Christ as faithfully as did the Apostles. 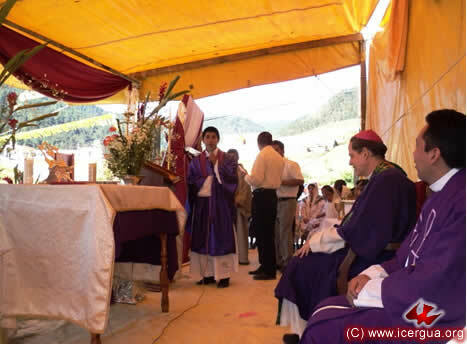 In the photograph at left, from left to right: Father Santos Acosta, who is charged with the pastoral care of the Deanery, the young people who were confirmed, Monsignor Eduardo, and Seminarian José Hernández, who was accompanying the bishop. 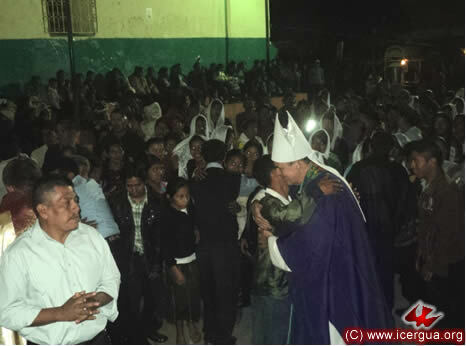 On Monday morning, December 20, our bishop had a long trip that began at the Huehuetenango Education Center, went on to Uspantán, El Quiché, then to Chicamán. The journey crossed entire Zona Reina. 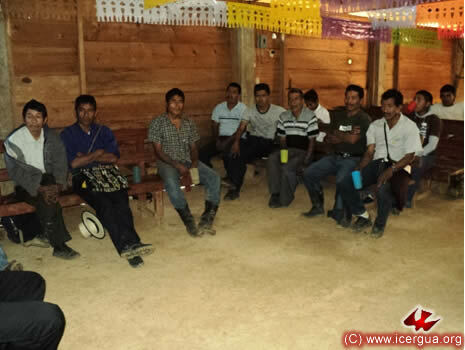 The purpose was to visit the western communities of the municipality of Cobán, which met in the Chamá Grande Center. These communities are in process of becoming a parish. 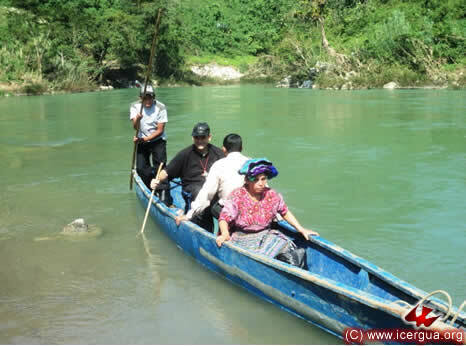 It will include the communities of the municipalities of Cobán and San Cristóbal in the Department of Alta Verapaz and two neighboring communities of the Zona Reina, which are in the municipality of Uspantán, El Quiché. After coming to the end of the highway at the side of Uspantán, the bishop left the car and walked to the banks of the Chixoy River. Above: The bishop with some of the faithful who had come to meet him. 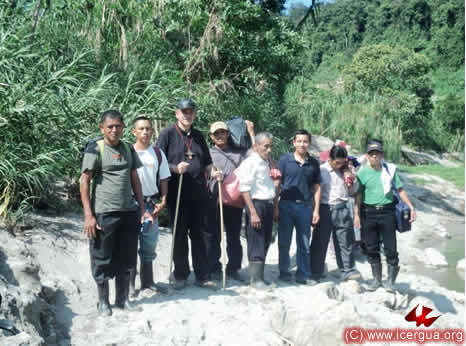 Right: The bishop with some of the faithful crossing the Chixoy River to the Department of Alta Verapaz and the city of Chamá Grande. The visit provided the opportunity for the bishop to celebrate the marriage of fourteen couples. All had been carefully prepared, and it was evident that those being married were deeply joyous, as was the whole community. The church was completely full, and for lack of space two thirds of the participants had to stay outside. Above and right: The Eucharistic celebration in which the fourteen couples married. The devotion and joy flooding through them can be clearly seen in their faces. After the celebration, all the faithful joined in a party. Father Denis Obando, presbyter of the Santísima Trinidad Parish, was accompanying the bishop. In the photograph he is at the bishop’s left. On the morning of December 21, our bishop visited the San Marcos El Triunfo Community in the northeast of the Zona Reina of Uspantán, and met with delegates of the various communities that are taking shape in this area. 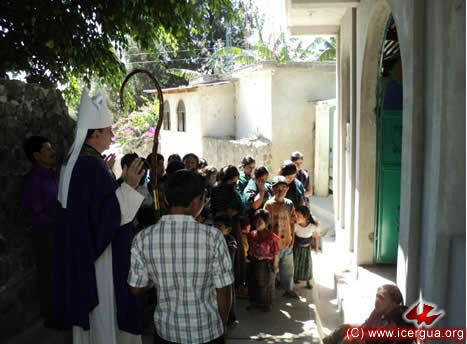 As soon as the bishop arrived, the faithful of San Marcos took him to the 1200 square meter lot where the house of prayer will soon be built. It is located in the very center of the community. Above: The arrival at San Marcos. 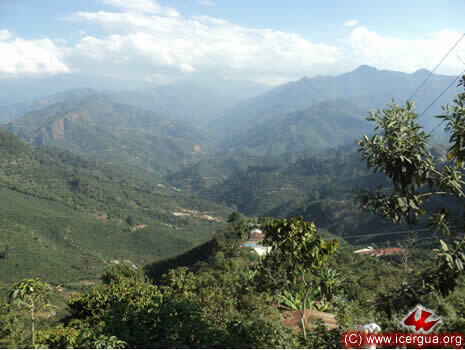 The mountains in the background form part of Ixcán, where the Santa Maria and San Juan Chactelá Communities are located. 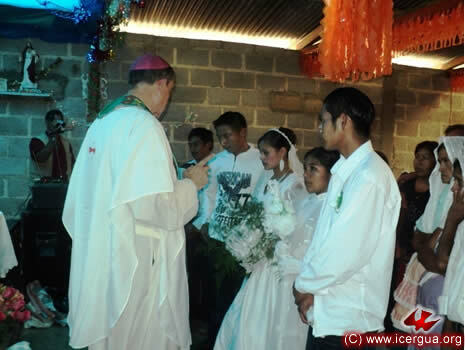 During the celebration of the Eucharist two children were initiated into the Christian life. Right: our bishop instructing the parents and sponsors about their promises. They attended to the instructions carefully. During the celebration of the Eucharist, eight faithful also received Solemn Communion. Left: some of these, devotedly thanking God for the gift they have received. ICERGUA has been deeply blessed during 2010. Almost all the communities have grown significantly. Many of them doubled; some even tripled. 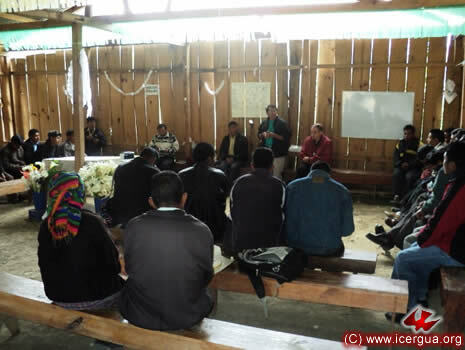 In addition many new communities have been formed, and also many already existing communities have covenanted with and joined ICERGUA. The result is that ICERGUA ends the year 2010 with half a million members. 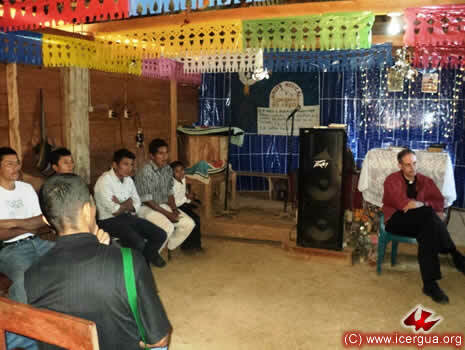 The most beautiful fact is that at least 70% of this half million participate actively and regularly in the life of the Church and more than 20% of the members are regarded as “servants,” that is, they have publicly promised to work actively to the end that the church may live its identity completely and fulfill its mission. These facts are supremely encouraging and fill us with joy. They also signify a great commitment, for the blessing that we are receiving reminds us also of the scope and magnitude of the mission that has been entrusted to us. Let us give thanks to the Lord and renew our pledge to be fully faithful to this mission, which involves accepting and implementing wholly and unconditionally the characteristics of the One, Holy, Catholic and Apostolic Church and to fulfill the mission to go into all the world and proclaim the Gospel to all creatures, so that all may be one, as the Father and the Son are One in the Holy Spirit. 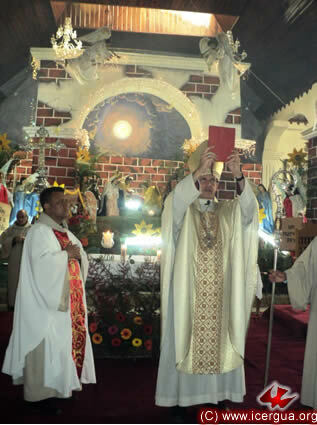 On the day of the birth of Christ, our bishop presided at the high liturgy of the Nativity in the Holy Cathedral of Saint John Comapala, Chimaltenango. The weeks of preparation for the celebration were charged with power and enthusiasm. 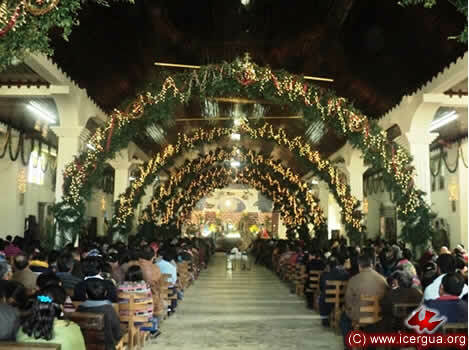 During the traditional posadas, which took place on the nights of the sixteenth to the twenty-third of December, tens of thousands of the faithful participated with great happiness. The Cathedral decoration was also splendid. 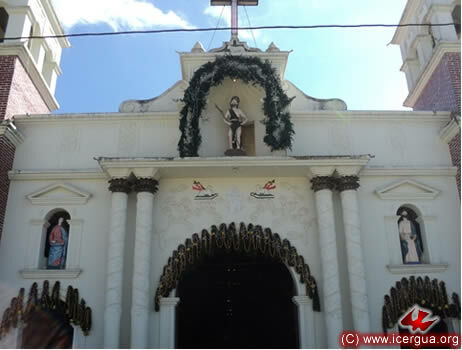 The Central Council decorated the sanctuary with most beautiful arches, and the young peoples group of San Juan worked for months on the Nativity scene. 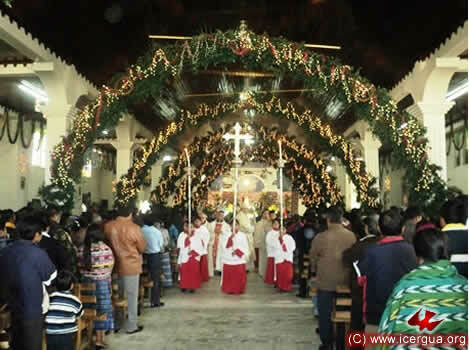 All was done with great gladness and, as the bishop stressed in the homily, the visible decoration and all the preparations they had made are an expression of the joy that fills the heart of the people of the San Juan Community. Above: The bishop blessing the book of the Gospels after Father Rigoberto Upún presented it to him, following the Gospel reading. Right: The central nave of the cathedral, with the Nativity scene at the back. Left: The bishop at the end of the celebration blessing the thousands of deeply devout parishioners who had participated in the celebration. Right: The recession at the end of the Eucharistic celebration. Left: The splendidly decorated colonial church during daytime. At night, the façade is magnificently illuminated, and becomes a spectacle of architectural beauty and light. 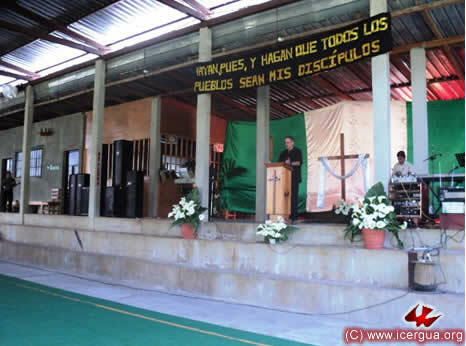 On Sunday, December 26, Monsignor Eduardo presided at the Education Assembly with the leaders of the eighteen communities of Uspantán and some representatives from the ten communities of the Zona Reina of Uspantán and Chicamán. It was a moment of special grace because the bishop’s theme was the characteristics that identify and distinguish our mission and the faithful expressed the great interest they have in committing themselves to be authentic apostles of Jesus Christ in the town. The Assembly finished with the Eucharist of the Holy Family. In response to the bishop’s invitation, the faithful promised to work for renewal that is complete and will deeply touch their family and neighbors. Above: The recession at the end of the Eucharistic celebration. Left: A group of altar boys and girls, carefully prepared by Father Denis Obando, pastor of the parish. The initiatives that have been taken are giving new life to the parish. 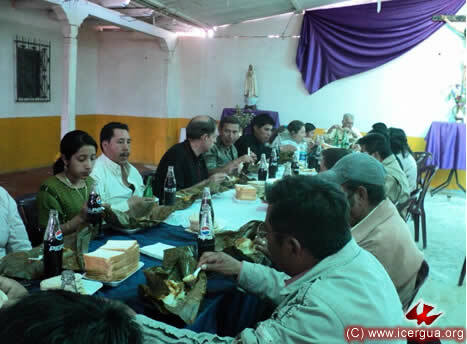 In the evening, Monsignor Eduardo had the meeting of the Central Quiché II Deanery with delegates that represent the various communities of Uspantán as well as the Zona Reina. The meeting began with the delegates’ reports on their communities. Then the bishop dealt with questions that were raised and laid out lines of action for the coming quarter year. Above: The bishop making some explanations after listening to the delegates’ community reports. 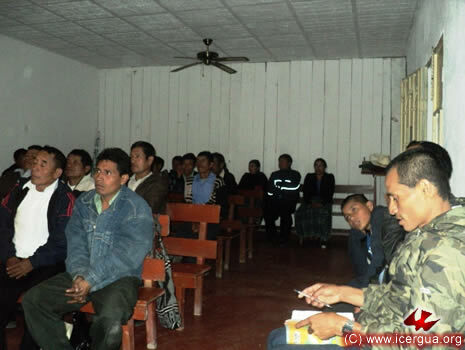 Right: The faithful during the meeting, listening attentively to the bishop’s comments. 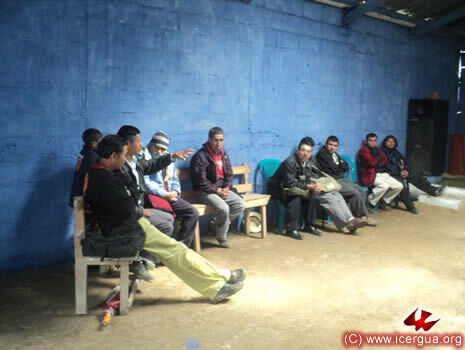 On Monday, December 27, the bishop met with the Deanery of Central Q uiché I in Cunén, with representatives from the Cunén and Sacapulas Communities. The faithful took stock of 2010 and shared their plans of action for 2011. 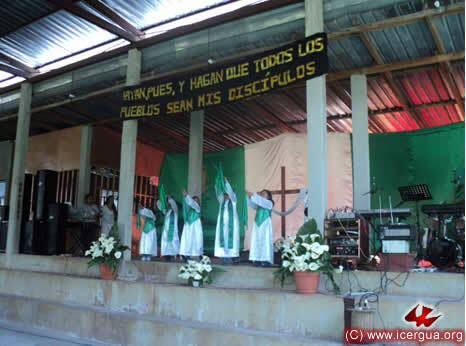 Among the initiatives of greater relevance were the commitment to organize a Center in Sacapulas and to create a community radio station in Cunén for evangelism and community service. 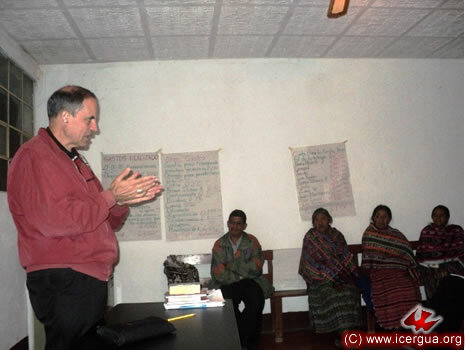 Above and right: In both photos Father Bernabé Mateo Nieto is reporting on the situation and the prospectus for action in 2011. The delegates and the bishop are following Father Bernabé’s report attentively. 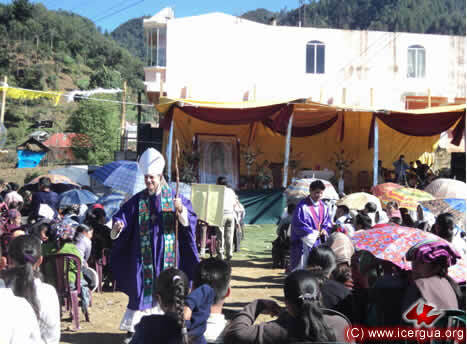 On the afternoon of December 27 the bishop celebrated Eucharist with the faithful of the Media Luna Community, Cunén. 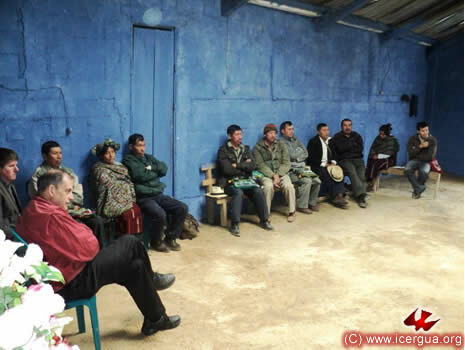 For those interested in forming a new community in the area between the Municipalities of Cunén and Sacapulas, the visit provided the opportunity to discuss the possibility. After considerable dialogue, the promise was made to proceed in this project with all possible force. 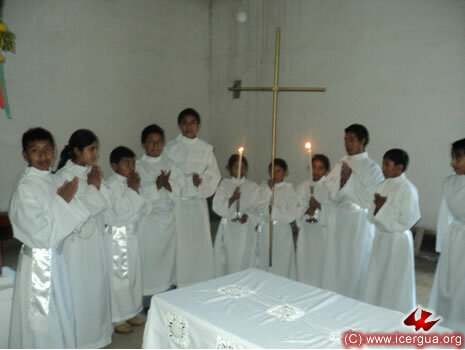 During the celebration a group of children received the sacraments of Christian Initiation. 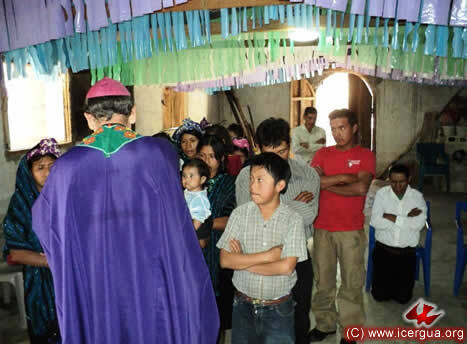 In the photograph at right can be seen the parents and sponsors praying over the children after the bishop concluded the liturgical ritual. 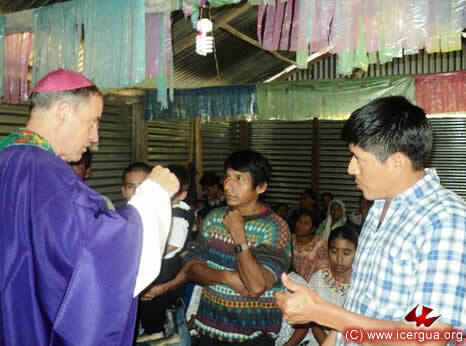 At the end of the afternoon the bishop visited the Puente Chuatuj Community in Sacapulas. It was also the opportunity to bless the house of prayer that the faithful had, with great effort, been able to build. The community is growing powerfully and in spite of the fact that the house of prayer has just been completed, it is already too small for the many faithful who were gathering. 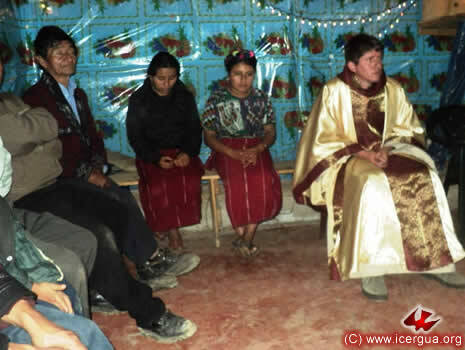 The bishop’s visit was the occasion for a couple to contract marriage and for their children to receive Christian Initiation. Above: The two photographs above show some of the faithful at the celebration. Left: The celebration of marriage at the moment when the couple exchange the bridal coins. On Tuesday, December 28, the meeting of the Deanery of North Quiché I took place. The atmosphere was very constructive. The faithful developed a mission plan and committed themselves to overcome the differences that have sometime existed in their work. Above: One of the faithful explaining the situation in his community to the full assembly. 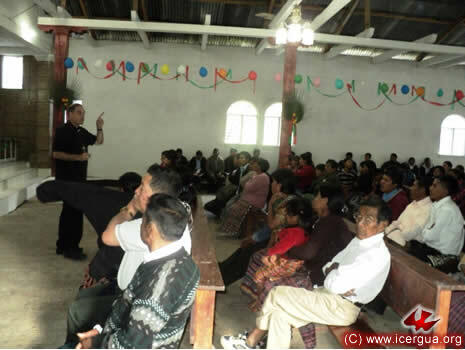 Right: The bishop and, at the bishop’s left, Father Marco Tulio Calderón, pastor of this area, along with the communities’ delegates are listening attentively to the reports about each of the communities. 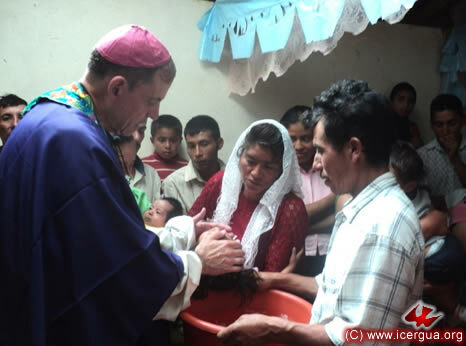 On the afternoon of December 28, the bishop visited the Chemamatzé Community in the Center of Nebaj. It provided the opportunity for a couple to contract marriage. 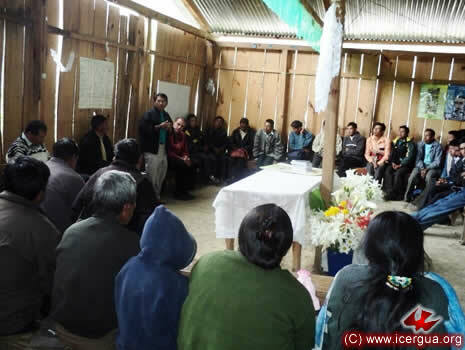 In addition, the younger son of the community leader, brother Jacinto, was initiated into the Christian life. Above: The bishop and the assembly praying and invoking the outpouring of the Holy Spirit on the child who was about to be initiated into Christian life. Right: The couple marrying exchange their consent in the presence of the bishop and all the assembly, whereupon the outpouring of the Holy Spirit on the newlyweds is invoked. 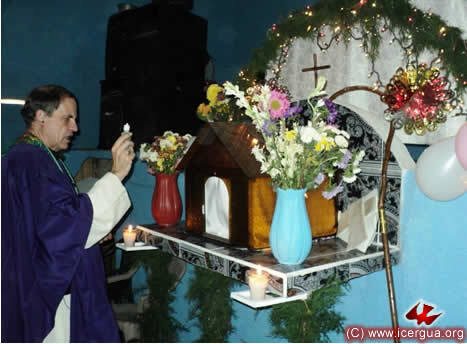 On the evening of December 28, Monsignor Eduardo presided at the Eucharist in the La Fe de los Mártires de Chajul Parish, El Quiché. The bishop’s visit provided the occasion for those who exercise various ministries to make the annual renewal their commitment. Chel is the center of the eastern part of the parish. 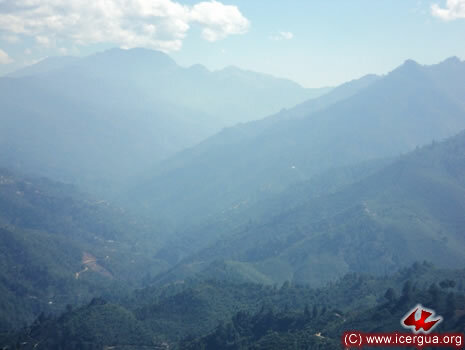 Several communities are organized around it in addition to those within Chel itself. Above: Father Marco Tulio Calderón, pastor to the parish, and some of the readers listening to the bishop’s homily. Right: The bishop during the homily, reminding the congregation that like the Innocent Saints and Martyrs of Chel all Christians are called to give witness to their faith, living a life that is consistent with the faith and allowing the gifts of the Spirit to be manifest in a total renewal, including everyday family life. 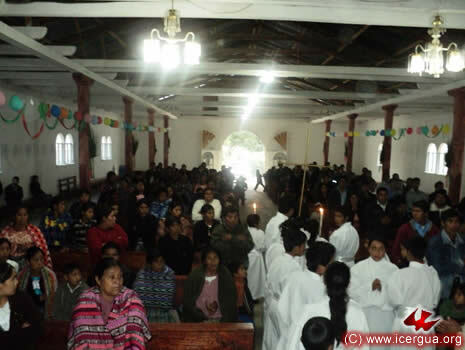 On Wednesday, December 29, the Deanery of North Quiché II took place at its headquarters in Ilom, which is also part of the Parish of La Fe de los Mártires de Chajul. Present were delegates from the numerous communities that make up the deanery. Each of them reported on the events of their communities. Special attention was paid to ideas about mechanisms for ensuring a continuous and consistent evangelism in all the communities. Above: The bishop and some of those in attendance listening to a delegate’s report. Right: The communities’ representatives attending to the bishop’s teaching. 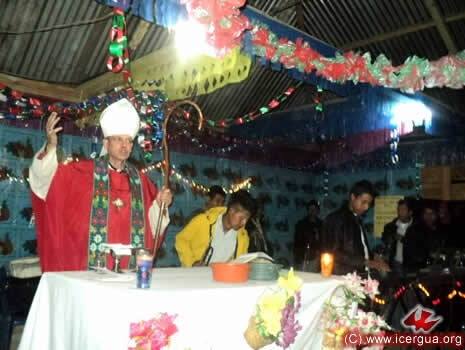 On the afternoon of the December 29, the bishop presided at the Eucharistic celebration in the Tzotzil, Chajul, Community. Nineteen confirmations were celebrated; the confirmands had been carefully prepared. Their participation was very positive, and they accepted the commitment to launch an evangelism program in the area where they work. Above: Some of those participating in the celebration. 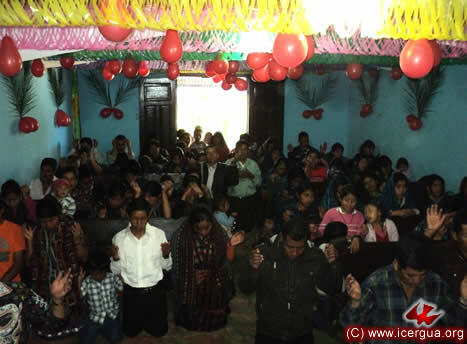 Right: Those confirmed praying intensely after receiving communion and lighting the candles that symbolize that on receiving Christian Initiation, they are firm in their promise to be apostles of Christ in the world. Left: After the ceremony, those confirmed posing with the bishop in front of the house of prayer. 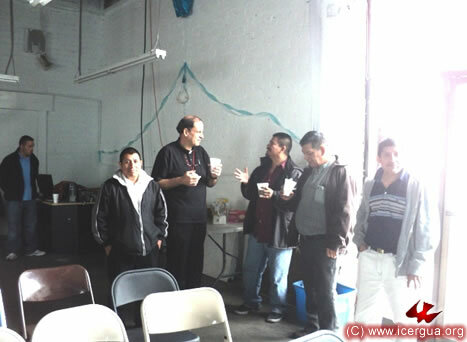 In the left foreground of the photograph is brother Manuel Solano, the catechist who prepared those who were confirmed. 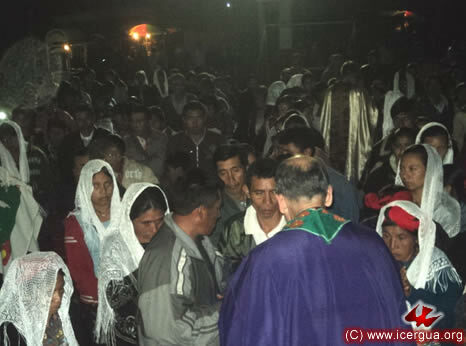 The bishop began his pastoral visits on Thursday, December 30, with the Pajales Community in San Antonio Huista, Huehuetenango. 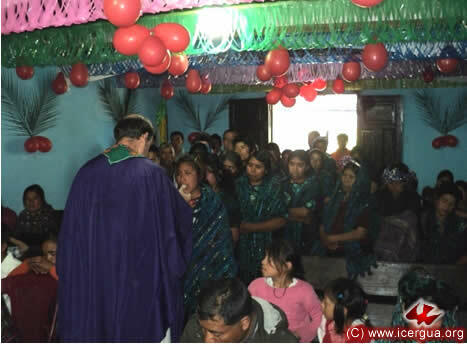 Several children were initiated into the Christian Life. 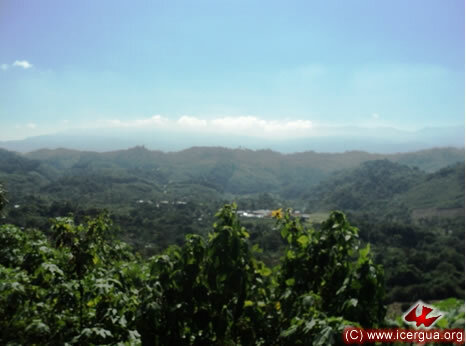 Recently the Pajales Community has been growing steadily. Several new families have joined and are receiving instruction so that they can be members of the community in every sense. 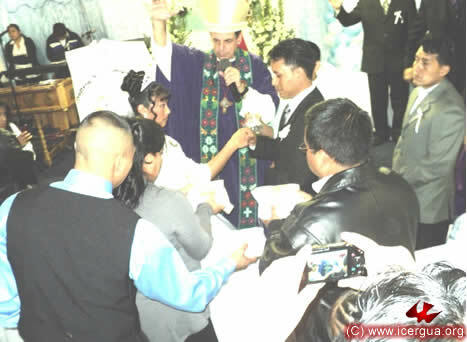 Right: After the baptism, the bishop handing one of the children to its father, saying, Receive this child who is now a child of God. 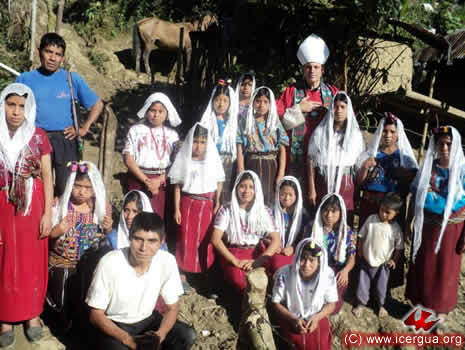 After Pajales and skirting the majestic peaks of the Western Cuchumatanes, the bishop visited the Nueva Esperanza Community in the municipality of La Democracia, Huehuetenango. 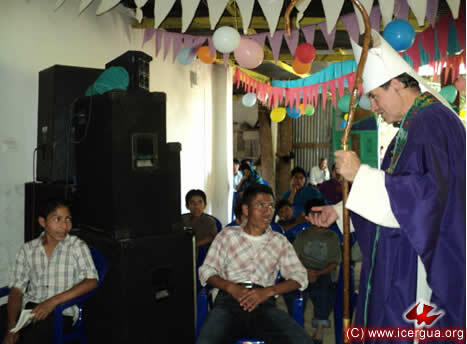 The bishop’s visit was the occasion for several children to be initiated into the Christian Life. 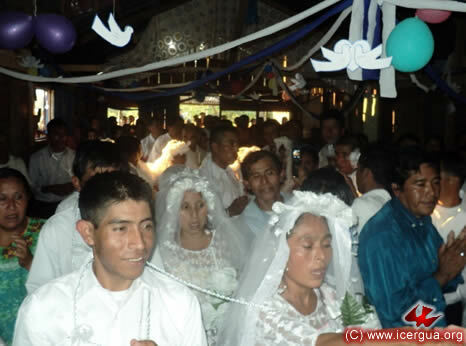 In addition, several marriages were celebrated and some young people were confirmed. Right: The bishop explaining the meaning of the celebration of the sacraments to the faithful and inviting them to accept the commitments that the sacraments bring with them. Two couples contracted marriage. Both had been carefully prepared, and they expressed their determination, with the help of the Holy Spirit, to let the sacramentality of the marriage be seen in their relationship, loving one another with the love that Christ has for his Church. 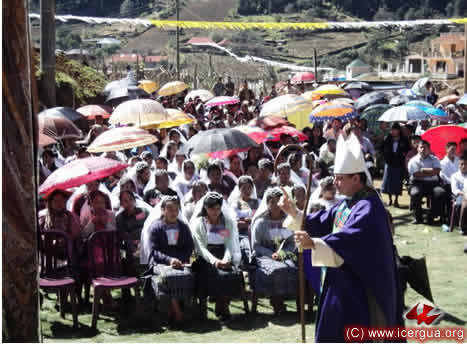 Then the bishop set off for the journey to Unión Cantinil to visit the La Esperanza Community, located in one of the valleys between two peaks of the Cuchumatanes. 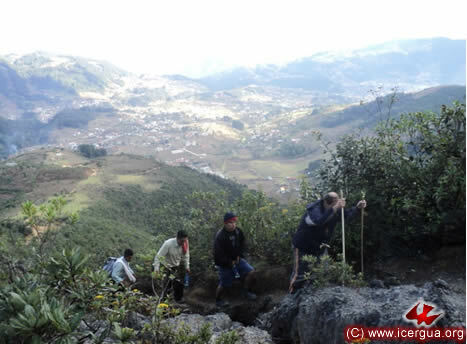 Right: The La Nueva Esperanza Community in the middle of the photograph. In the back is the La Esperanza Community. 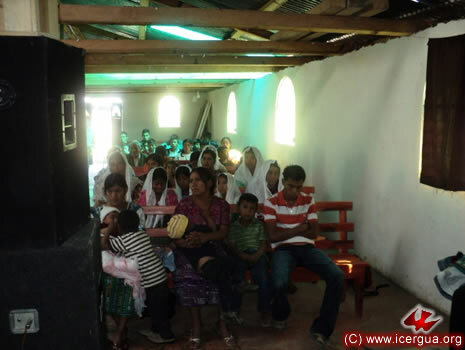 The La Esperanza Community recently bought a lot on which a church will be built. At present, the celebrations take place in the home of the community coordinators. 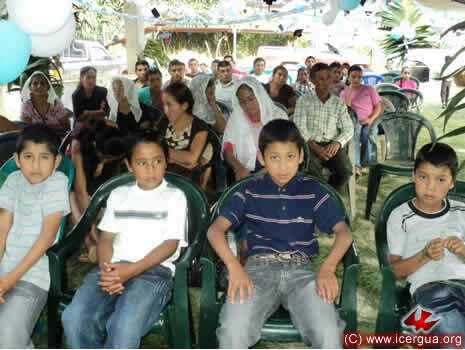 Left, on the front row, is the family of brother Audón, who is the community coordinator. One of the problems that the La Esperanza Community is facing is related to the culture of the region, namely it is almost exclusively women who participate in the life of the community. For this reason, the bishop insisted on the importance of continual pastoral work with the young boys so that as they grow up in the faith they may become able to challenge these cultural assumptions and commit themselves to the life of the community. One example of the many initiatives that can be taken was to ask them to participate as altar boys in the December 30 celebration, which they did with great pleasure. 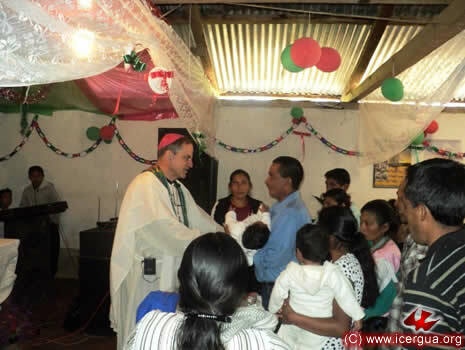 On the morning of the December 31 the bishop made his first visit to the Carbonal Community in Sactic, Santa Bárbara, Huehuetenango, close to the border with the Department of San Marcos. The community is now committed to evangelistic work throughout the area. On the bishop’s visit, several of the faithful brought their children to receive Christian Initiation. Right: Preparation for the celebration of Christian Initiation. 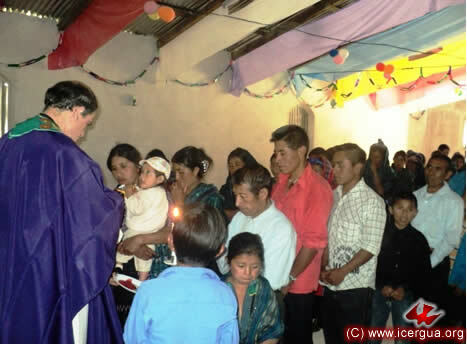 A family that recently joined the community presented its four children to be initiated into Christian life. 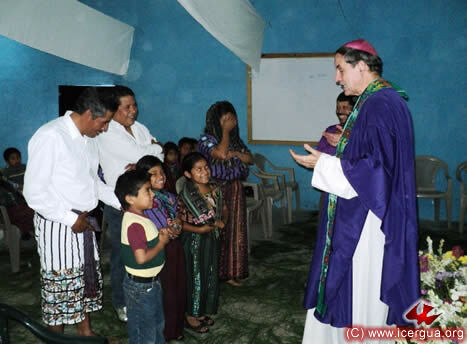 On the evening of December 31, the bishop celebrated a Thanksgiving Mass with the personnel that live in the Huehuetenango Education Center. The family of Carlos, Floridalma and their sons Kelly and Adolfo have lived there almost four years now. Originally from San Andrés Semetabaj, the Education Center is now their second home. At present there is also a large family from Barillas resident at the Center, helping with maintenance, security and other tasks. Above and right: Two moments of the Thanksgiving Mass for the year 2010 and prayer that the year 2011 may be one of blessings for everyone.